Many students of the Civil War proclaim that the "war was won in the west" while everybody was paying attention to Washington/Richmond/Virginia, or make comments about the western and trans-Mississippi theaters beings overlooked. Lee's refusal to leave Virginia is a common example cited to support this position, an argument that perhaps has even become a bit of a cliche by now. Even if it is a cliche, however, I must ask how much of this is still occurring? Over the last few weeks, much has been written/spoken and/or blogged about the Maryland Campaign, South Mountain, Lost Orders and the Emancipation Proclamation that appeared in the immediate aftermath of Antietam. Before that, 2nd Bull Run and the defense of Washington D.C. were common topics. Even the recent PBS program about death in the Civil War referred to Gettysburg as "the Confederacy's second invasion of the North." (If those are not the exact words, they are close and have the same meaning.) Presumably (and if I'm wrong, let me know), they meant Antietam as the first invasion. Well, if an invasion of a border state, where slavery was legal and many people expressed southern sentiments is considered an "invasion of the north," what about the Confederate invasion of Kentucky? Was Maryland "northern" and Kentucky "southern" despite their similarities? 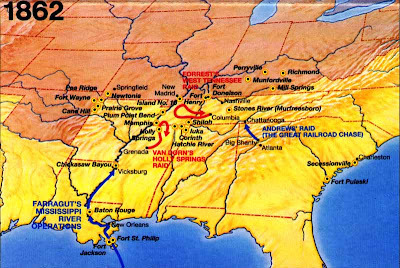 Why not count Braxton Bragg and Kirby Smith's trek into President Lincoln's native state? What about the fighting in Missouri? Did the writers of the program just focus only on the east? I have read that critique of the program from others, so is this one, seemingly innocuous remark just another example of that focus? And I realize that griping about that one line out of the two-hour program may not be fair and my taking notice of it says as much or more about me than the program, but I do still feel this is a point worth making. Was Maryland that much more north geographically to make that distinction between it and Kentucky (or Missouri)? Or was it just close enough to Washington D.C. to garner more attention, even 150 years later? Even recently, a well-respected blog just announced some upcoming plans for several battles and campaigns, such as Fredericksburg and Chancellorsville. They then threw out a bone for those interested in the western theater by promising a look at Stone's River too. Not a single word about Perryville, though participants described it as perhaps the toughest fighting they experienced. Granted, maybe I am being a bit oversensitive about this. The Seven Score and Ten blog I mentioned a week or two ago has continued to bring attention to some of the happenings in the campaign that led to Perryville and my personal appreciation of the Perryville battlefield probably causes me to look for items about that one particular fight. Maybe the blogs and articles about the other battles are being written and created because that's what people truly want to study. Or maybe I'm missing out on others that focus more on the west. Hopefully most of the blogs and sites I follow (including Facebook and twitter) will start focusing more on the west as the anniversary of events in the region get closer. Many post "on this date" type of stories and though the Kentucky campaign was in full force by this time in 1862, no major fighting had taken place yet, other than perhaps Munfordville. Hopefully as we arrive at October 8, 2012, more attention and writing will focus on the events of October 8, 1862. I really did not intend for this to turn into a rant, but that one line from the PBS program really did light a fire that had been smoldering and I thought it was time I threw some gas on it and express these thoughts and observations.